A memoir from within the mind of an amnesiac, in full terrifying color. In the opening scene of The Answer to the Riddle Is Me, David Stuart Maclean “wakes up” in a standing position, in a train station, in a place where English is clearly not the first language. He doesn’t know who he is, where he is or where he was going. A friendly policeman tells him that many tourists there do too many drugs and end up confused; Maclean concludes that he is a drug user and follows as he is told. This scene is only the beginning of the enormous world of what Maclean can’t remember, and assumptions he’ll be led to make that will often turn out to be false. He was living alone in India on a government grant to aid his work as a novelist when an antimalarial drug he was taking overcame the blood-brain barrier and wreaked havoc. 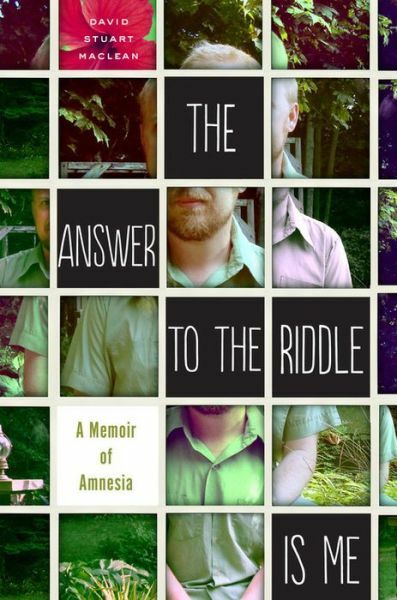 The Answer to the Riddle Is Me is Maclean’s story of amnesia and recovery, with all the false starts, depression, despair and small victories that come with such a trauma. Maclean often wishes himself back in a hospital where he’ll be spoon-fed and his decisions will be made for him, but he slowly, eventually resurfaces. This heartfelt and painfully candid memoir tracks Maclean in real time, in fractured scenes and then in measured, purposeful steps, and comes with research into the medical issues involved. Readers will be mesmerized by the effort, and perhaps feel as rejuvenated in the end as Maclean does. This review originally ran in the February 11, 2014 issue of Shelf Awareness for Readers. To subscribe, click here, and you’ll receive two issues per week of book reviews and other bookish fun! I hadn’t heard of this one–sounds fascinating!